For a journalist like Guha, SLAPP or Strategic Lawsuit Against Public Participation is no fun actually. Now globally prevalent, it is a lawsuit that is intended to silence and even harass critics, to the point when they withdraw their voice of dissent. Lawsuits come with burgeoning legal costs and journalists often have to fight them with their own money and this can take years in the court. To add, a journalist can also lose his or her job while all this happens. So why was Guha so amused? 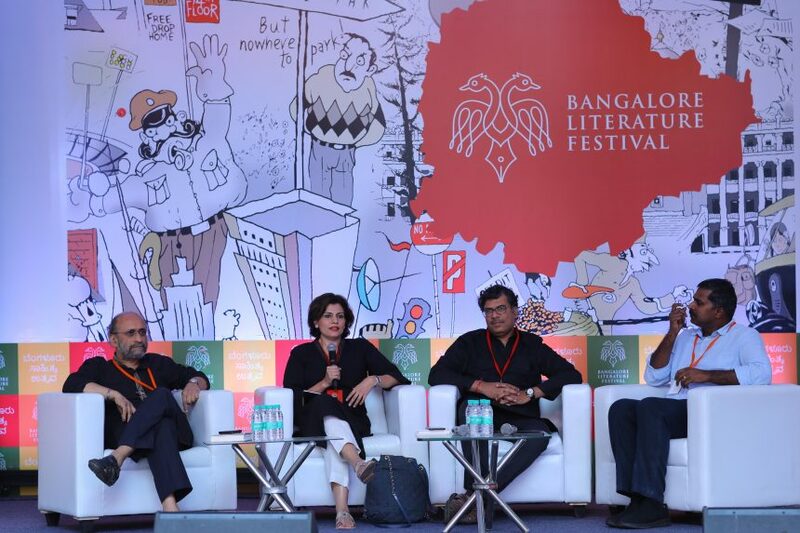 On the first day of Bangalore Literature Festival, this was the focal point of discussion among the panel which consisted stalwarts of modern day media houses. Along with Guha, we had Nidhi Razdan, Maheshwar Peri, and Josy Joseph – all very distinguished and eminent figures from the domain of news reporting, education & media. Most of the panel was draped in black and even though Nidhi jovially mentioned that this was just a coincidence, the general audience could perceive that the individuals in the panel had chosen to showcase their dissent against corporate bullying independently in today’s forum. Josy Joseph – a decorated and leading investigative journalist – highlighted that, since corporates have access to a gamut of high profile lawyers, they can find ways to file lawsuits in courts across regions and geographies, making it very costly and difficult for the journalists to defend themselves. He cited his current dispute with jet airways and all that he has to put up with his own money. He says – “When the establishment goes after you, it will try to dominate”. But a journalist should have the ethics and values to report what is wrong. Not reporting a wrong-doing is also a crime. Guha spoke about the vulnerability of media houses since most of them they are backed and funded by large corporate investors. Journalists have their own right to expression and freedom of speech, but sometimes they can also get things wrong. There should be a limit to every form of freedom or else it can become abusive. Freedom of expression does not mean posting vulgar content on social media. But who shall decide what is wrong and what is right? Who shall be the one to impose reasonable restrictions on hyper journalism or sensationalism? In a democracy like ours, this responsibility cannot be with the police or the local mafia. There has to be intervention from the court, says Guha. The talks continued to explore different business models for today’s media houses to exist. In an investor-backed setup, there can be restrictions on news coverage, says Maheshwar who did not accept any funding when he exposed IIPM. On the other hand, crowdfunding could be an option for media houses to arrange funds, says an optimistic Guha. All the panellists showed serious concern on the safety of critics and journalists. According to Guha, the recent murder of Gauri Lankesh has highlighted that how unprotected journalists are or can be. Gauri could reach out to people in small towns and get to the fact of the matter, but that did make her more vulnerable. There are very few women journalists as brave as she was and hence, the need of the system that protects them. Finally, the panel had a unanimous message for anyone who decides to fight the wrong or the corrupt. “Help will come, you will find supporters!” said Maheshwar. Find the courage, and “Speak Up”.